Although the Gonzo’s Quest video slot from NetEnt was launched way back in 2010, the level of high-quality graphics, animations, sound and avalanche feature still make it one of the most popular video slot games around. You will find this game predominately displayed at online casinos due to its great gameplay. You will initially be presented with a video introduction to the game showing that it is set in 1541 off the coast of Peru. The theme is set around Spanish explorers on the quest for gold. However, Gonzo decides to take the map and head off in search of the gold for himself. This then leads you into the game itself where you will play using their avalanche feature rather than spinning reels. Gonzo’s Quest Video Slot is a 5-reel, 3-row, 20-line game that introduced the Avalanche™ feature mentioned above and also includes Free Falls wins and Wild substitutions. The game has 20 fixed bet lines, 1-5 bet levels and different coin values. The Peruvian Symbols are all set within a jungle backdrop and Gonzo is at your side encouraging you to get wins. The game has 6 coin value setting from 0.01 up to 0.50 and 5 levels. This means you can spin the reels from as little as 20p up to a maximum of £50 per spin. The game has a maximum win of 2500 coins for 5 of the highest symbol, which is then multiplied by any applicable multipliers. Before you play you should set the coin value per spin which is activated by the ‘coin value’ button to the right of the spin button. On the left side, you can then set the bet level. Make sure you set them so that the cost per spin is one you are comfortable with. You can then spin the reels using the green coloured button in the centre of the bottom part of the Gonzo’s Quest game. You will also see a ‘Max Bet’ feature which will instantly set the game to spin at the maximum value per spin. You can also automatically set the game to spin on its own using the ‘Auto’ feature. You will find this on the bottom left of the game. You can set the game to spin up to 1,000 times automatically. Unlike some of the more up to date NetEnt games, the number of features is limited in comparison. This can mean that you sometimes feel the gameplay is a bit flat and you are waiting for a feature for quite a while. As the tiles fall into place when you hit the spin button, this avalanche style of play makes the game feel unusual and that in itself makes the game fun. Matching tiles will produce a win if there are 3 together within a win line. These will then break apart and new tiles will fall into place. You will also get an increase on the multipliers for each win ranging from X1, X2, X3 to X5. Therefore, the more coinciding wins the biggest the prize to be won. The game has Wild symbols in the form of question marks which will substitute for any symbol. The main symbol you are looking for is the gold coloured Free Fall symbol. You need to have one of these symbols appear on the first three rows to activate the feature. 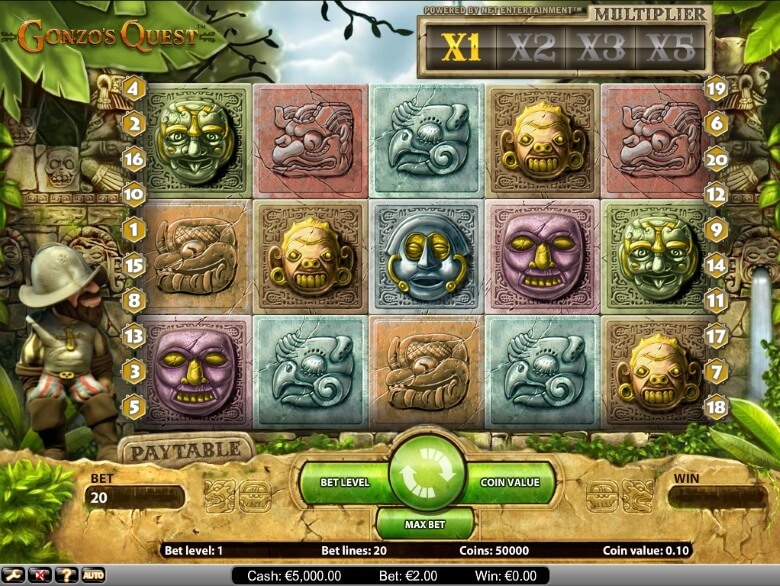 This will give you 10 Free Spins of the tiles with increased multiplier of X3, X6, X9 to X15. You can win additional Free Fall spins during the feature itself. On the very bottom bar of the game on the left, you will see several options including a question mark, auto, volume control and settings. The question mark gives you information about the game and the settings allow you to change graphic settings, remove intro and sound effects. Before you start to play the Gonzo’s Quest online slot we would suggest you become familiar with the pay line structure and features. At the bottom of the first column of tiles, you will see the word ‘Paytable’. Click this to reveal details of the Avalanche Multipliers, information on the Wild and Free Fall symbols and payout values for all other symbols. The very top of this popup window will show you the structure of the 20 pay lines. Selecting the question mark symbol will show you the game rules along with a further outline of the game features, the game functions and controls, game terminology and more. 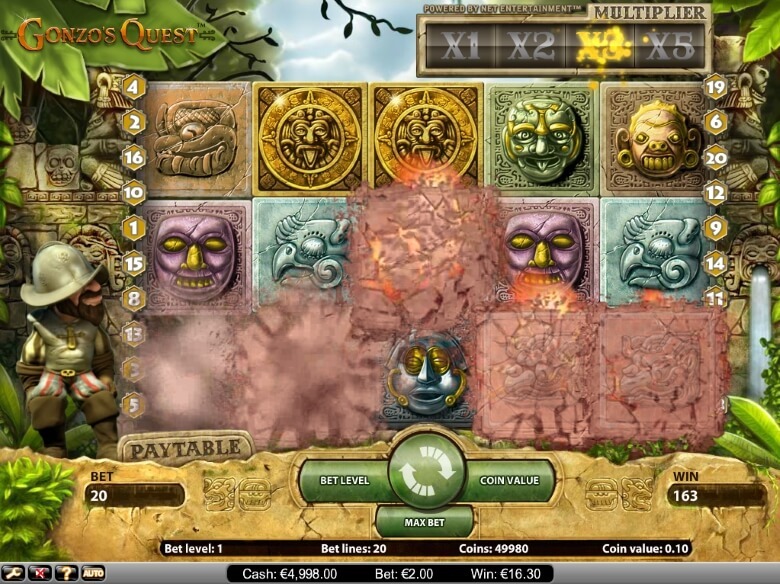 We would recommend that you try Gonzo’s Quest by Netent in demo mode or fun mode as known at some online casinos. This will mean you can enjoy learning how the game plays before spending any real cash. You can change to real cash play at any time. You can play Gonzo’s Quest video slot for free at Casino Cruise and GDay Casino. Is Gonzo’s Quest the right video slot for you? The game has a theoretical RTP (return to player) of 96.0% giving a house edge of 4.00% which is not as good for the player as other NetEnt video slots. In our test of 150 spins we found quite a few dry spells and when wins came in, even though the multiplier would kick in, the overall prize was small. Within our spins, we also only achieved the Free Fall feature once. The number of coins at that point was quite high with a payout of 315 coins. Based on our gameplay we would put this video slot as a medium to high variance game and not neccessarily the best slot to wager through a free casino bonus. In summary, the gameplay is still fun and the animations look far from outdated for a game released in 2010. However, compared to some of the new releases the features are limited and the RTP is not as good. However, by way of a change to a normal spinning reel slot, the avalanche feature makes the game entertaining.